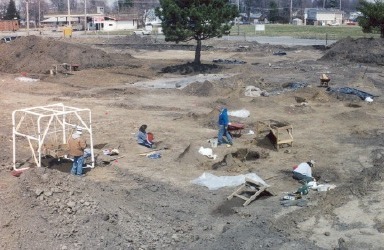 Excavation of Stirling and Oneota structures. Excavation of East Oneota Cluster pits. The 78th Street site is a large multi-component habitation located in the heart of East St. Louis, Illinois. The site's prehistoric components include not only a Mississippian occupation but an Oneota Native American occupation with one of the largest Oneota assemblages excavated in the American Bottom to date. First identified in 1989 during the course of a cultural resource inventory undertaken prior to the construction of the Bluffview Estates residential development, the large scale mitigation of the southern portion of the 78th Street site was conducted by Prairie Archaeology & Research in 2005. These investigations were limited to an area south of State Street within a 4.5-acre community park. Based on the redevelopment of the park for use as the location of the new Edgemont Elementary School, archaeologists from PAR were contracted to excavate over 100 prehistoric cultural features. 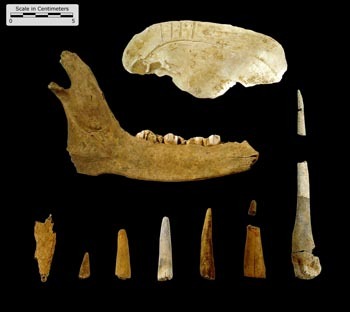 Excavation of these features resulted in the recovery of temporally diagnostic material dating to the transitional Lohmann to Stirling phases of the Mississippian period (which spanned from 1000 A.D. to 1150 A.D.) intertwined with a later Groves or Vulcan phase Oneota occupation dating to 1300 to 1400 A.D. In all, 98 pit features and six structures were excavated during the spring and summer of 2005. Arranged in five very distinct clusters, the prehistoric component of the site south of East State Street encompassed an area of approximately 1.2 hectares. The Lohmann occupation consisted of a spatially distinct cluster of six pits surrounding a single post structure in the southern portion of the site. Although the artifact assemblage associated with the Lohmann occupation was notably small, one shell-tempered vessel was identified. Based on the presence of the post-in ground structure and the absence of Ramey-Incised jars a Lohmann phase affiliation was assigned to this cluster. The Stirling phase use of the site was represented by two clusters: East Stirling and West Stirling. Although the Stirling phase vessel assemblage at 78th Street was not large in terms of quantity of material, a variety of vessel types including jars, bowls, pans, and seed jars were present. Temper type identified within the vessel assemblage was primarily limestone with a high occurrence of crushed shell. Typical of Stirling phase occupations, the 78th Street site produced five Ramey Incised jars (all of which were identified from within the East Cluster). Ramey Incised jars first appear during the Stirling phase in the American Bottom. In addition, three wall trench structures and a post structure that was interpret as an elevated granary or open-walled arbor were associated with the Stirling phase occupation. 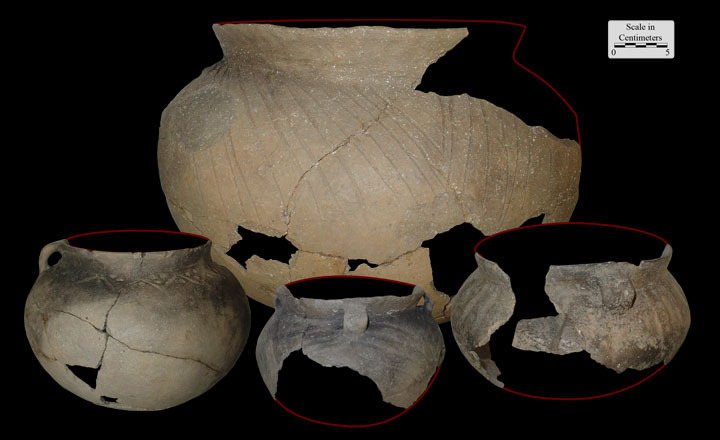 Although analysis is on going, the East Stirling Cluster is interpreted as having a communally-oriented civic or ceremonial purpose based on the presence of the Ramey-Incised vessels. The Oneota component of the site is represented by 42 pits distributed within two spatially distinct clusters: East Oneota and West Oneota. A single structure, a wall-trench structure, representing a large square was associated with the occupation. The cultural material assemblage is large, diverse, and represents one of the largest Oneota assemblages excavated in the American Bottom. Minimally, the ceramic assemblage includes 60 vessels. The range of decorative motifs include medium-width nested lines, frequent use of punctuates and dashes, wide trailing, and circle and dot designs. A number of jars are affixed with loop handles, several of which are decorated with horizontal and vertical lines. 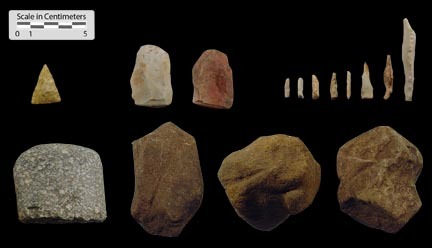 The stone tool assemblage includes a number of triangular points and thumbnail scrapers characteristic of Oneota assemblages. In addition, the Oneota faunal assemblage from the 78th Street site is the largest Oneota assemblage analyzed to date for the American Bottom. Watch our video featuring the 78th Street Site.